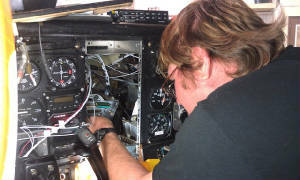 May 11, 2013: Wild Mama has her new engine, MT prop and EI MVP50. Click HERE for reports and photos. 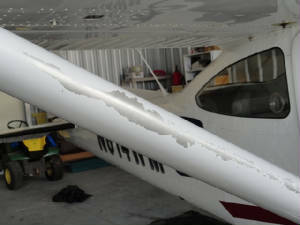 Now that the 2011 Air Race Classic is a recent memory, Wild Mama is due for her long needed repairs from the hail damage she suffered at the hands of the 2011 Sun-n-Fun tornado. 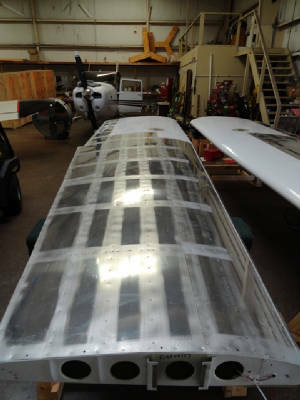 July 5th is her official start date for restoration and Vern will be pulling her in the hangar to start stripping all of the stuff out of the wings, starting with the fuel. We are documenting her transformation with the before and after pictures so, please, follow along to watch her transform back into the shining beauty she was. Her paint is peeling off of her right wing. 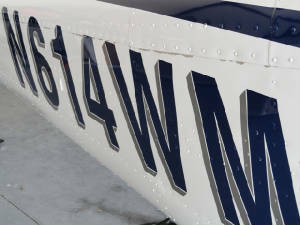 We have flown the paint off of her numbers. 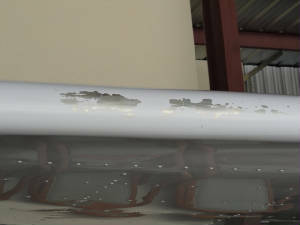 Paint was tornado blasted off trailing edges. Paint is coming off of her struts. 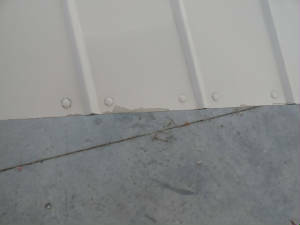 Paint is peeling off at the seams. Phase I - Damage Repair and Reconstruction: Vern has been taking care of Wild Mama since her adoption into the family. But now he has the extra burden of taking her wings off and getting them back together in perfect flight condition. 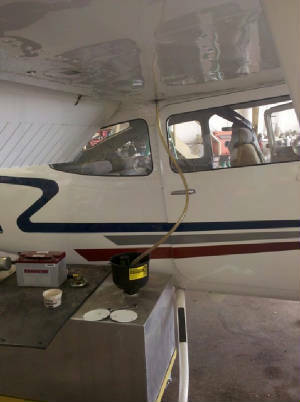 The first step in getting the wings off is getting the fuel out. 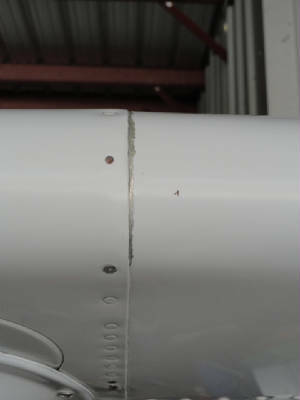 We had flown out as much fuel as possible so the draining process would be a bit shorter but drain Vern did. Following the fuel, all of the servos, wires, probes, vents, fuel bladders and EVERYTHING had to come out of the wings and the flaps and ailerons had to come off of the wings. Vern could accomplish most of this himself with the help of Tad; but the final part of the wing removal will take an army of men. 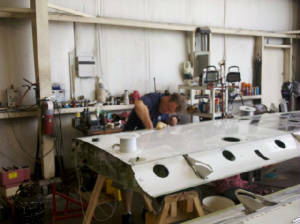 The wing bolds have to be removed; the strut bolts have to be removed and the wings have to be lifted off and pulled out and placed into the wing box for shipping out to the wing re-skinner in Indiana. July 15th was the day that all gathered to pull off the wings. 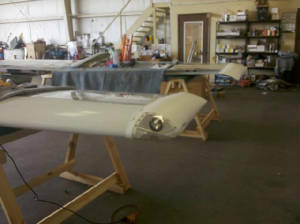 Vern constructed a huge wing box to put the wing in for shipping. 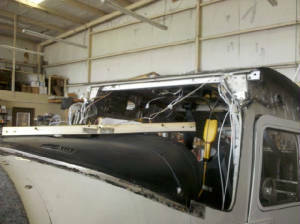 It took 4 men to hold the wings while the bolts and struts were removed. They laid them across the saw horses - specially constructed for the job - then stood them up and packed them in the shipping crate. Monday morning, July 17th, they were loaded onto a truck. Vern, Vince and Mike got together to coordinate the process using Mike's forklift. The box weighted over 750 pounds with the wings packed inside. We will await the call from Indiana that the have arrived safely. 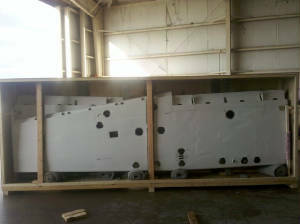 August 10th: With all of the damages repaired, we got the call today that the wings are ready to be shipped back. 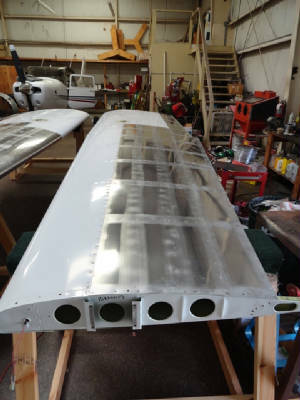 All of the other parts and pieces are in for the upgrades so as soon as the wings arrive, Vern will start the re-construction process, then off to the paint shop!!! 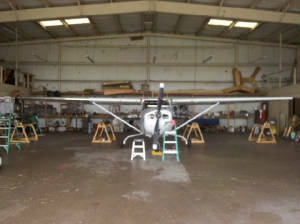 August 22nd: The wings have arrived back at Vern's hangar. They were uncrated and are safe and sound and in excellent condition. The repair work is supurb! September 5th: After much head scratching, rivet bucking, sanding, drilling and just plain ole hard work, Vern has the wings back on Wild Mama. In the mean time, he removed the windshield for replacement; installed new wing tip lights, installed a new 406 ELT; installed new plastics and started the process of readying her for the paint shop. Voice Flight installation is complete. 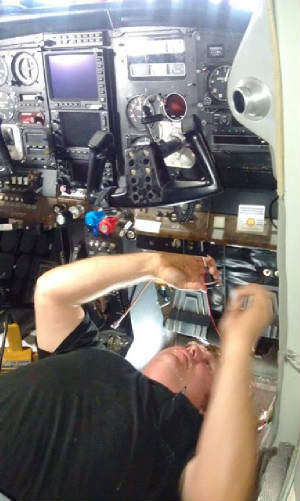 Wild Mama looked like she got sick all over herself with the installation of the Voice Flight - she was a mass of wires and more wires; but as Vern has finished the install: all we can see are a couple toggle switches to activate the Voice Flight and the data port for the database upload and iPad upload. Flight testing was awesome. On an IFR trip to X59, we input the flight plan, change it, did a "direct to" and never took our eyes off of our instrument scan. Today we used the data link from the iPad. Check out the video and be sure to email me to arrange your demo of the Voice Flight.